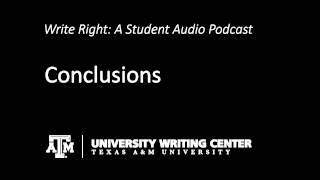 MEGHAN: Good morning Aggieland and welcome to “Write Right,” the Texas A&M University Writing Center’s student podcast. I’m your host Meghan Wall, and we’re playing the “Who wants to be a Writer” Game. The focus today is on conclusions. Test how knowledgeable you are when it comes to the last words of an essay. Do you know why conclusions are important, how you write them or the common mistakes people make when writing them? Play along and find out the answers to these questions and more up next! REGGIE: Hi I’m Reggie Philman and welcome to “Who Wants to be a Writer,” where contestants are tested on their writing knowledge and try to win $1,000,000. Our first contestant is Julie Farmer from Plantersville, Texas. Hi Julie! JULIE: Hi Reggie, I’m just so excited. I love this show, and I’ve been watching it for years! REGGIE: That’s great Julie. We’re happy to have you. So you know about the rules. Each question has 4 possible answers, and if you need help you have 3 lifelines: ask the audience, 50/50, and phone a friend. JULIE: I sure am ready! REGGIE: Okay, Julie! The first question is for $1000. REGGIE: Which one of the following is not a reason conclusions are important? JULIE: Um, I’m going to go with b. because I don’t think that they leave a final impression on the reader. I mean, no one cares about the conclusion. By the time they get to the end of the paper, they’re just ready to be done with it. JULIE: What!! My English teacher lied to me! REGGIE: I’m sorry, but correct answer was D because conclusions are not the easiest part of the paper to write. In fact, they’re usually one of the hardest because writers feel that they have nothing left to say after having written the paper. It’s not A, B, or C because the conclusions do give the essay a sense of completeness, it does leave a final impression on the reader, and definitely helps reiterate the thesis statement. Better luck next time Julie. Now on to our next contestant Mike Goodman from Cincinnati, Ohio. Welcome to the show Mike! MIKE: Ya know Reggie it’s like this, I’ve been preparing for this all year, so I think I’ll go home with the $1,000,000 tonight. REGGIE: HAHA! I like your confidence, Goodman. Let’s see what you can do. REGGIE: What is a good phrase to use when starting your conclusion? D. There is no set format or phrase in writing a good conclusion, just use a good transition that is original and catches the reader’s attention. MIKE: Well, that’s no problem Reggie. When concluding a speech you would use those concluding phrases to help let your audience know that you are almost done speaking. But since this is “Who Wants to be a Writer,” then I am guessing this question is talking about essay conclusions. And in that case, those phrases come across as boring and overused. I’m going with D because there is no set format or phrase for writing a good conclusion. You should just use a good original transition that catches the reader’s attention. REGGIE: Okay Mike, we’re now going for 10,000. REGGIE: When writing your conclusion which technique should you use? D. Add in new information that you couldn’t fit in anywhere else. MIKE: Man! That’s tough, well I know that it’s not B. because the paper should always state the thesis at the beginning and not wait until the end. And I know it’s not D because adding random information at the end of an essay will just create confusion. It’s between A and C for me. I’d like to use one of my lifelines, Reggie and call my mom. She’s an English teacher, and she should know this. REGGIE: And what is your mom’s name, Mike? MIKE: Her name is Rose. REGGIE: Okay. Let’s get Rose on the line. REGGIE: Hi Rose, this is Reggie from “Who wants to be a Writer,” and we’ve got your son Mike here. Now he’s going to read you the…..
ROSE: Oh Reggie, we watch all the time! Just let me talk to Mike. MIKE: Hi Mom! So do you want to summarize or synthesize in your conclusion? ROSE: Honey, I can’t believe you don’t know this! A summary is just simply repeating what you’ve already said. How boring would that be! You need to SHOW them how the points you made and the support and examples that you used were not random, but fit together. And that is called synthesizing. MIKE: Okay Mom, I’ve got it. The answer is C. When writing your conclusion you should synthesize by demonstrating how your evidence fits together and create new meaning. Final answer! REGGIE: Alright you’re doing great, how about we go for $100,000? REGGIE: Which question is used as a strategy to help you write an effective conclusion? MIKE: Ooh, I’m going to need some help on this one. I’ll take a 50/50. REGGIE: Alright Computer, take away two possible answers. REGGIE: so now you’re down to B. So what? And C. But when? MIKE: Well I’m not positive so I’m going to take a guess and say C. But when? MIKE: (in dejected disappointment) OOooooh!!!!!!!!! REGGIE: I’m sorry Mike. The correct answer was so what? But you still get $10,000. Great Job! Yeah, this strategy is useful when you can’t think of anything else to say. Just ask yourself “so what?” after every statement in your conclusion, so that you have to create new meanings based on your findings. REGGIE: Okay, our next player is Taylor Thompson from San Francisco, California. Welcome to the show, Taylor. TAYLOR: Hi Reggie! It’s great to be here! REGGIE: Well, no time to waste. Let’s get started. TAYLOR: Hmm…Well in San Francisco to get from one place to another we have to use a bridge so I think it may be the same way in an essay. An introduction and conclusion frame your thoughts and bridge your ideas for the reader. So I’m going to go with C: bridge. REGGIE: The introduction can act as a bridge that transports readers from their own lives into the “place” of the analysis, and the conclusion provides a bridge that can bring them back to their daily lives. REGGIE: Alright now let’s go for $10,000. REGGIE: What technique does the strategy of echoing the introduction use? TAYLOR: Well I know that it can’t be A or C because those would be what not to do. By just simply restating your thesis you do not push your ideas forward in any way, and it shows that you have nothing else to say. And in an analytical paper an emotional appeal would be out of character. Now while asking questions that make people reevaluate their own views is a good conclusion writing strategy it doesn’t fit the description of the question. That’s why I’m going to go with B. Echoing the introduction is when you create a scenario in the introduction and pick it back up in the conclusion. REGGIE: The strategy of echoing the introduction can help bring the reader full:circle by taking the original scenario a step further. If you don’t want to use an anecdote you can simply incorporate themes, concepts, or images from the intro to tie the work together. REGGIE: Alright your on a roll let’s go for $100,000. REGGIE: What type of conclusion writing strategy can be used in an argumentation essay? TAYLOR: Well, I know it’s not D, an apologetic conclusion, because in an argumentative essay the purpose is to persuade the reader of your ideas and an apology would undercut that attempt. And if I put this question into the terms of a debate then yes it should be persuasive, and you are seeking a solution which is like a prescription but neither of those fully encompasses the answer. I think the word we are looking for is a proposal conclusion. That is because the writer is arguing for a change and therefore would ask the readers to do something with a call to action. I’ll go with A, a proposal conclusion. REGGIE: A proposal conclusion can redirect your reader’s thought process and help her to apply your info and ideas to her own life or to see the broader implications. REGGIE: Well Taylor you are just 2 questions away from million dollars! How about we go for $500,000! TAYLOR: Bring it on, REGGIE! REGGIE: Which of the following is not a strategy for redirecting your readers in your conclusion? TAYLOR: Well Reggie, I think I want to use one of my lifelines on this one. Can I ask the audience? REGGIE: Alright if everyone in the audience could take out their key pads and please select A, B, C or D.
REGGIE: Answer B was the majority vote with 55% of people saying that “avoiding the reader” was not a strategy for redirecting readers. 15% thought “A. challenging the reader,” “C. looking to the future,” and “D. posing questions” were not strategies for redirecting the reader. TAYLOR: Well that is a quite a majority of people against “avoiding the reader.” It seems that by issuing a challenge to your readers, you are helping them to redirect the information in the paper, and they may apply it to their own lives. And by “looking to the future” you can emphasize the importance of your paper or redirect the reader’s thought process. “Looking to the future” might help them apply the new information to their lives or see things more globally. And “posing a question” could help readers gain a new perspective on the topic, which they may not have held before reading the conclusion. So I guess I will have to go with the audience and say that B. avoiding the reader is not a strategy for redirecting readers in the conclusion. REGGIE: And you are right for $500,000!! REGGIE: And now for the Million Dollar Question! REGGIE: What service does the Texas A&M University Writing Center Provide? TAYLOR: Haha! Well as a recent graduate from Texas A&M University…! TAYLOR: …I know a few things about the writing center. Lets see, well I haven’t gotten free food there but they do have complimentary mints. And although they can’t introduce you to your soul mate they will help you write letters. And finally they don’t guarantee A’s but I know I always did considerably better on the paper’s I took to the writing center for help. So I guess my answer would have to be D because I know that they will provide assistance with conclusion writing as well as all of your other writing needs. That’s my final answer. REGGIE: well… you might want to give a little back to them now because you are correct! REGGIE: You have just one a million dollars!! Congratulations! !